Well you might not think it makes much difference but actually when we Tweet is very important in gaining maximum exposure. You know the term so I won’t explain but it very much applies to Twitter. When do you use Twitter most? Mornings, afternoons? Yes different people use Twitter at different times that suit their social and work patterns. Most people actually access Twitter when they are not at work so generally evenings are best however if you are targeting businesses then you might find the best time to Tweet would be during working hours for that business. So based on the information above you need to identify at what times your target audience is most engaged on Twitter. You can consider their habits and read a ton of blogs on the subject. Another great way is to experiment. Start by scheduling tweets at regular intervals throughout the day and night, yes people use Twitter day and night and this applies if you are targeting other countries and need to take time zones into consideration. Then monitor these Tweets to get a feel for when you get most interactions, Follows, Re-Tweets and Likes. You might also want to check your website traffic and see if there are any peeks that coincide with any specific Tweets or Tweet times. Of course you will also need to consider that people scroll through Tweets and can sometimes interact with a Tweet many hours or even days after it was sent but generally this is minimal. 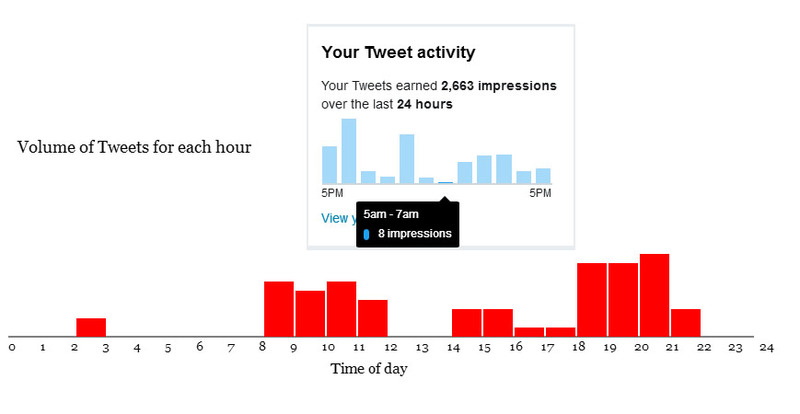 Anther good way to monitor your interactions is to use the Twitter Analytics. On your Twitter profile page is a little graph showing the number of impressions or views of your Tweets. You should pay attention to the highest and lowest values since these are most important and you will most likely be surprised at the times when the highest impressions occur. You can compare this graph with the times you Tweet which can be viewed by clicking on the Tweet Data menu option in Sweeter Tweet. You might find that a large number of Tweets at certain times are not getting very good impressions. Equally you might find a high impression time matches a time when you send few Tweets. I would defiantly recommend increasing the number of Tweets you send at those times. 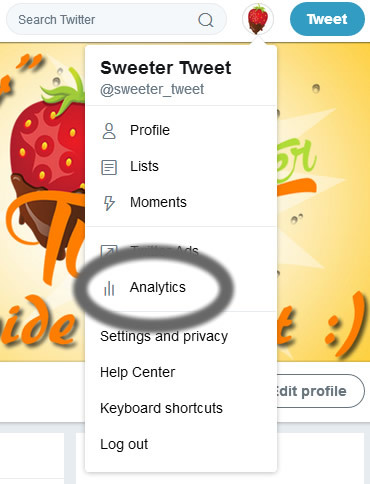 Twitter also offers a more advanced look at your statistics which can be accessed from twitter by clicking on your account icon and clicking Analytics. You will then see a summary of your Twitter Statistics for the current month and highlights of previous months. 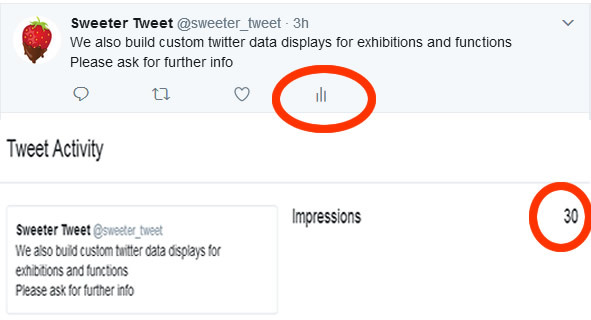 To asses the value of individual Tweets you can click on the little graph icon that is below every Tweet on your Twitter feed and a popup will show you how many impressions that Tweet has received. 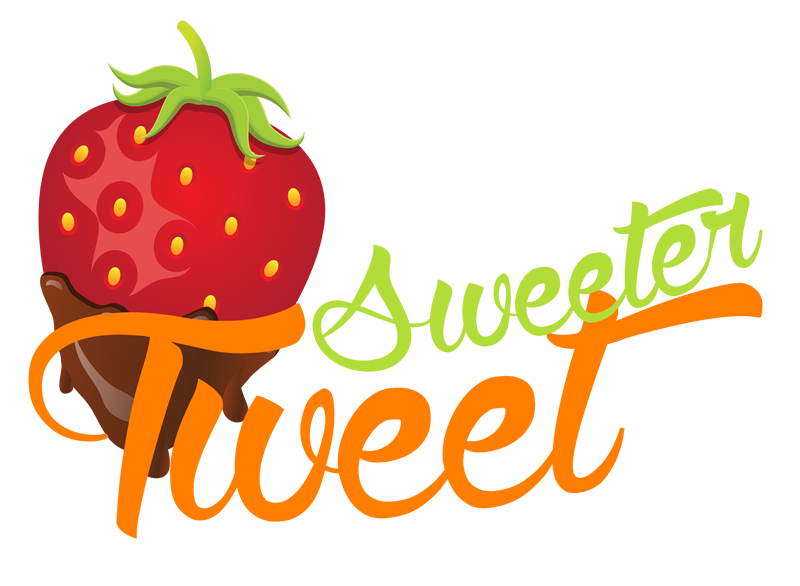 It does take a bit of time to identify your best tweeting times but once you do you can concentrate your Tweets around those times and specifically include your most powerful promotional Tweets for maximum interaction.